Many people assume adding more deodorant to their daily routine will help stop the armpit sweat stains from forming on their favorite shirts. However, it’s been proven that it isn’t just you: it’s your deodorant. While you’ve been trying to figure out how to stop excessive sweating, your reliable deodorant has, in fact, betrayed you. So, how do you stop heavy sweating? Sweat stains form from, well, sweat, but not sweat alone; it’s the combination of your sweat mingling with the aluminum in your antiperspirants that’s causing the yellow stains at your armpits. Think about it: have you ever gotten a sweat stain on the back of your shirt? Or your pants? Wherever you apply deodorant may discolor your favorite garment when you actually start to sweat. Can I remove the stains? If you can’t go without your favorite deodorant, you can remove the stains with a stain remover. You can also make a simple at-home mixture of hydrogen peroxide, dish soap, and baking soda if you’re on a budget. Scrub the mixture with an old toothbrush or sponge, then put it in the washing machine an hour later. If you find yourself sweating a lot, you might have hyperhidrosis. This disorder is seen in both men and women, but most sufferers experience this symptom between the ages of 25 and 64. 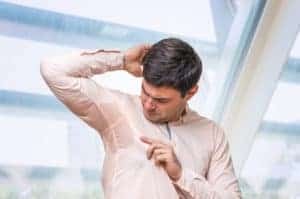 It can be caused by some neurological, endocrine, or other diseases, but it can happen in otherwise perfectly healthy people that sweat a lot, regardless of the weather or temperature. What other options are there for sweat management? A common method to stop or reduce your constant sweating is to use alternative deodorants that do not contain aluminum. If that doesn’t work, you may be prescribed by a doctor to undergo iontophoresis, a technique that allows ionized water to go through the skin via electrical currents. Additionally, you can choose to undergo laser correction that kills sweat glands or take oral medication. As a last resort, you can also get surgery. Talk to your doctor about your options on how to stop excessive sweating. If you have hyperhidrosis, using an over-the-counter medication may be the right route in preventing excessive sweating. Regardless, trying different methods to stop the sweat is beneficial to both you, and your countless stained shirts.